While most of us scoff at spending more than £200 on a motherboard, most manufacturers do have a couple of examples that demand you reach deeper into your wallets. However, occasionally they also have a flagship model that's so expensive you'd have to be slightly mad to buy it. That's essentially where the Gigabyte Z390 Aorus Xtreme fits in the overall scheme of things, retailing for nearly twice the price of the next most expensive Aorus-branded Z390 board. So, why on earth would you spend this much money on a mainstream chipset motherboard when the same cash could net you a decent Intel X299 or AMD X399 board with a few hundred pounds spare to put towards a CPU? And even sticking to Intel Z390, why would you spend this much when other boards such as the Z390 Aorus Master retail for less than £300? Well, if you simply must have the best that the mainstream has to offer in terms of features, power delivery, and overclocking tools, then Gigabyte really does make you feel as if your £500 has been well spent. You get 16 power phases, a huge heatsink array, Intel Thunderbolt 3, beefed up audio, 10Gbit LAN, a suitably vivid lighting display, and some of the best accessories we've ever seen with a motherboard. 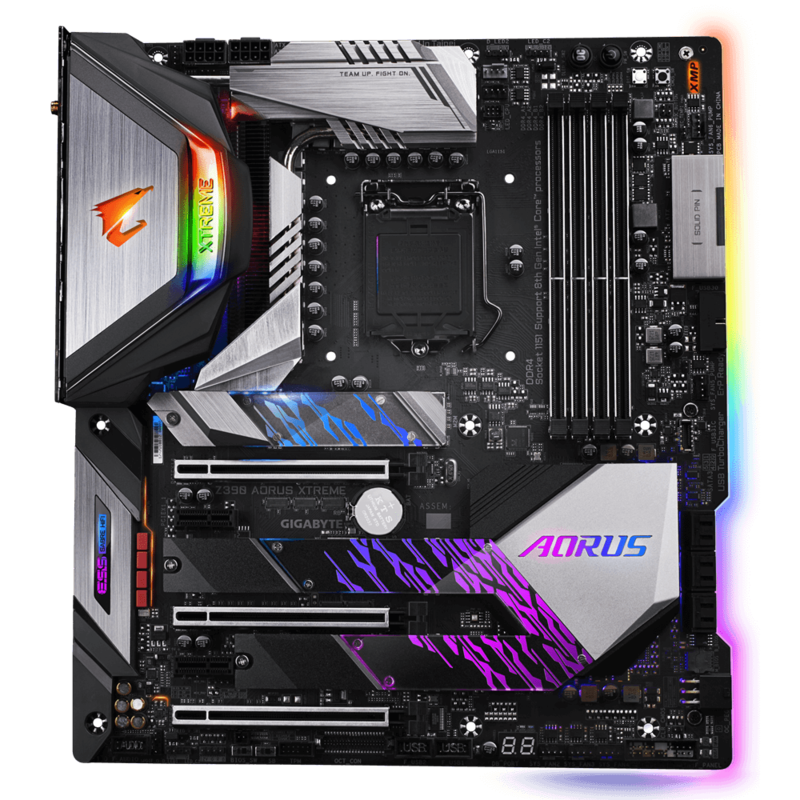 Starting with the RGB lighting, the Z390 Aorus Xtreme sports a variety of lighting zones including a diffusing strip of acrylic on the rear of the PCB that catches the LEDs and makes the edge of the board glow. You also get several onboard RGB headers plus Gigabyte's RGB Fan Commander, which we'll get to in a minute. Perhaps the only slightly lacklustre feature on the board are the SATA ports - or lack of them. Six is reasonable, but for the cash you'd maybe expect more, although if £500 for a motherboard seems reasonable to you, you're probably going to be rocking a couple of Samsung 2TB 970 Pro M.2 SSDs anyway, and with 10TB hard disks available for less than £300, you'd still be able to house an obscene amount of data before running out of ports. As you'd expect, there's a full-fat USB 3.1 Type-C header for the latest compatible cases plus extra power for graphics cards, although you're still limited to 16 lanes (x8/x8) since this is Z390 and not X299. The M.2 ports themselves comprise a pair of SATA 6Gbps/PCIe 3.0 x4-compatible ports along with a PCIe 3.0 x4-only port, all of which are covered by heatsinks as you can see in the first couple of photos above. Probably our favourite feature on the board itself is the angled 24-pin ATX connector. It's a small touch but one that experienced builders will know can make a huge difference to cable routing and maintaining as clean a look as possible. Much like integrated I/O shields - also present on the board - we'd like to see these become regular features on all boards. As you'd expect at this price, you get the full complement of overclocking and testing tools to make the board just as handy outside the case for extreme overclocking sessions as it is for pre-install testing and troubleshooting for a regular gaming rig. Power, reset, and clear CMOS buttons come as standard with a POST code LED display on the bottom of the PCB too. The rear I/O panel, with snazzy integrated shield, offers eight Type-A USB ports with a mix of two USB 2.0, two USB 3.0, and four USB 3.1 Gen 2, and you also get twin USB 3.1 Gen 2 Type-C ports with Thunderbolt 3 support too. You also get gold-plated audio ports, Wi-Fi aerial ports, and two LAN ports, with one dishing out 10Gbit LAN courtesy of an Aquantia controller. Unusually for such a high-end board, you also get an HDMI output, which is always useful for troubleshooting graphics cards. Some of the best accessories we've seen with a motherboard include the RGB Fan Commander below and OC Touch Panel above. The latter adds six more fan headers to the existing eight plus base clock and CPU ratio adjuster buttons, over a dozen voltage check points, and more conveniently-accessed power, reset, and clear CMOS switches all on a separate PCB. Whether you want to expand your cooling options, create a crazy bench table, or just dabble in some extreme overclocking, the OC Touch Panel is a fitting addition for any extreme enthusiast. The RGB Fan Commander is actually a fairly serious bit of kit, able to add an additional eight fan headers, plus eight apiece of four-pin 12V and three-pin addressable RGB LED headers (via extension/splitter cables), all with independent lighting patterns that can be controlled using Gigabyte's RGB software and a plethora of included cables that make the RGB Fan Commander the most RGB-friendly board we've ever seen. However, this accolade is sadly marred by the fact that Gigabyte's RGB control software has been revealed to have serious security flaws as you can read about here, and the current advice remains to leave it uninstalled.